Mexicans are rapists but their leaders deserve respect because they're a lot smarter than us. And the plane up there could Mexican, ready to attack. I don't even want to know how such a thing popped into his head to say. The result? You end up with is a new Spanish word, "Trumpear," which basically means to vilify people in ridiculous ways. Venezuela Shortages: Half Glass Full! We're starting to see stories by reporters sympathetic to the Venezuelan government that acknowledge the huge problems facing the country, but downplay them. Shortages in hospitals? It sparks innovation! Another way they have sought to overcome shortages is by developing a barter system with other hospitals in Caracas, keeping tabs on who has what and swapping where they can. Last month, Zayra Medina was briefly arrested by police detectives after she was stopped transporting boxes of medicines in her car. There have certainly been cases of corrupt doctors and hospital administrators diverting drugs onto the parallel market where they can sell them at a big profit, or siphoning them off to the private clinics where most of them also work. Medina insists that this time it was a misunderstanding. She was taking the drugs to the University Hospital where a colleague was in urgent need of them. Both the police and her staff seemed to believe her. Several of them tell me she is an inspired, and inspiring, leader. This is true in Cuba, where innovation in the face of extreme scarcity is legendary. But it's a model of desperation rather than development. If hospitals are engaged in bartering, then you're in serious crisis. And remember, this is a Telesur article, which is putting the most positive spin possible on the situation. Who Will Defend Nicolas Maduro? Bueller? If Maduro were voted out tomorrow, what should be done to get Venezuela back on firm ground? What stood out for me immediately is that there is not a single sentence defending Nicolás Maduro, no one trying to say there are reasons not to assume he'll be voted out. As a matter of fact, I cannot find anyone anywhere defending his actions/policies. Mark Weisbrot is left simply arguing that no one wants to invest in Venezuela because of U.S. policy (yes, this is what he argues) while the other sympathetic article calls--quite reasonably--for any post-Maduro government not to dismantle existing community organizations. So who will defend Maduro? Erica S. Simmons, "Corn, Markets, and Mobilization in Mexico." Comparative Politics 48, 3 (April 2016): 413-431. (Here is an ungated version). This made me think of Venezuela. If corn to make arepas, a Venezuelan staple, becomes scarcer, will this lead to more broad-based protests? A Senior Associate Editor with the Washington Post interviewed Michel Temer. There is interesting stuff in there, but the interview is awful. The reporter wants to make clear to Temer that she is on his side (e.g. "you have a good economic team" and "many believe you are doing the right thing") which skews it badly. Questions are also posed in a way that sound tough but give him wiggle room. Do you think that Brazil is just addicted to corruption? In your system, the president has to go and get votes from the parties in Congress. To get the votes, they have to give favors to the parties. So isn’t it endemic in the way the system is set up? I wouldn’t say that it is an endemic problem. I would say that corruption is individualized. It is Congressman A or B or C. The criticism that might be made of our system and would require a political reform is the large number of political parties that we have. We have 32. We need a rule that says only political parties that receive a certain number of minimum votes would be represented. This is a terrible question. The reporter should've stopped with the first sentence and made him squirm. Corruption is embedded in Brazilian politics and has been so for many years. Instead of pushing him, the reporter answers it for him, and falsely! Now, you can make a case that a large number of parties requires so much logrolling that it leads to corrupt practices. But that's hardly the single factor that created and perpetuated Brazil's corruption. If Brazil suddenly had four parties, corruption wouldn't go away. By the way, representative democracy requires the president to go and get votes from the legislature. She ends by answering another question for him, and saying he has personal conviction when in fact he answered a question about Venezuela without mentioning personal conviction. In short, it's a fawning interview with a corrupt president who has put in office by questionable means. Jeff Duncan (R-SC, who is on the House Foreign Affairs Committee) made comments about Venezuela (basically offhand in response to others' comments) in a hearing. What he said depends on who you ask. Duncan suggested the United States impose more economic sanctions against Venezuelan government officials directly responsible for human rights violations. U.S. Representative Jeff Duncan, chairman of the House subcommittee for the Western Hemisphere, rejected the idea of placing more sanctions against Venezuela during a hearing Wednesday. "The Venezuelan people are hurting, so I don't know how sanctions help," Duncan said in response to calls from other members of Congress for sanctions. Just skimming, I can't find those exact quotes in the video, If you take a look you can see there is a lot of interest in sanctions. It is a hardline hearing attended only by Republicans. There's even discussion about how Nicolás Maduro might be refusing to step down because the U.S. buckled under to Cuba. The funny thing about the somewhat triumphant Telesur quote is that it misses the gist, which is that Venezuelans are so screwed we shouldn't hurt them more. The FARC and the Colombian government have agreed to a ceasefire, which will facilitate the demobilization of FARC combatants (assuming the Colombian people approve the peace deal in a referendum). As the government says, it is the "end of the war in Colombia." The FARC talks of "Bilateral and Final Ceasefire and Cessation of Hostilities." Even more incredibly, Alvaro Uribe actually said he didn't want to make any declaration based on only first impressions. This from a guy ready to base declarations on any rumor he happened to grab off Twitter. There will be ceremony today in Havana, where the talks have been taking place. It's the end of another Cold War relic. Cuba hosts talks that get support from the United States in order to end a Marxist insurgency. This was a war that started before I was born, and which has taken and/or ruined so many lives. The war and all its repercussions made many see Colombia as a failed state into the 1990s. Violence beget violence. Even now, 6 million people are displaced, which I wish got more attention. This is huge and historic. There is no way for the Colombian state to become real in all the far flung rural areas without the war's end. But the war's end is the beginning for paying attention to rural areas. There is much to do, but this is great news. A timely article on Venezuelan public opinion by Mariana Rodríguez at Vanderbilt using LAPOP data. Surprise: scarcity bothers people a lot. The analysis shows that if you view scarcity as a problem, you are more likely to protest. 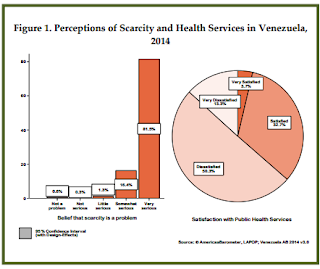 Furthermore, the data also provide evidence that concern about the scarcity of basic goods and dissatisfaction with medical services motivate protest participation, while views of corruption do not. Corruption alone doesn't do it, but when you cannot get basic goods, then you protest. And this is from 2014 data. Imagine now. OAS & Venezuela: What Should We Expect? Tomorrow the OAS will be meeting to discuss the question of invoking the Democratic Charter, with lots of intense discussions going on ahead of time. What should we expect? As I've written before at Latin America Goes Global, I think the most that can happen with the OAS and Venezuela is real regional dialogue about the state of democracy there. Nothing else really can happen. Since the Democratic Charter was approved in 2001, it's been little used. With the 2002 Venezuelan coup, the OAS passed a quick resolution but pro-democracy Venezuelans solved the situation themselves quickly before any other action was taken. According to the best information available at the time, President Chavez had fired his vice president, dismissed his cabinet, and resigned, and was arranging another hasty trip to Cuba. Therefore, on April 12, Pedro Carmona swore himself in as provisional president, called for new elections, and ordered that the National Assembly and Supreme Tribunal of Justice be dissolved. President Chavez returned to office late at night on April 13. It's simply comical. That gives you a good sense of how the Bush administration viewed the Democratic Charter. In 2009 the OAS suspended Honduras because of the coup there. The result? Nothing. Latin America--including Venezuela--pretty much looked to the United States to resolve the crisis. In 2012, the OAS had no interest in backing Fernando Lugo after he was removed from power, and you could really say the same about Brazil in 2016. If Latin American leaders don't want the OAS to work, then it won't. Even Mauricio Macri, a harsh critic of the Maduro government, values maneuvers to get an Argentine (Susana Malcorra) named Secretary General of the UN more than the Democratic Charter. Therefore I wouldn't look for suspension of Venezuela from the OAS, or even a resolution with harsh condemnation. With Tom Shannon currently talking to the Venezuelan government, we might see some more commitment by Maduro for dialogue/negotiation, but the difficult part is the recall referendum, which both sides have publicly declared non-negotiable. At this point dialogue that doesn't include the referendum is essentially equivalent to stalling, which benefits the government. Este contexto pone de relieve la urgencia y la necesidad de diversificar las exportaciones de la región a China, que continúan altamente concentradas (soja, cobre, mineral de hierro y crudo representan cerca del 50% de las exportaciones). Es cierto que los commodities probablemente continuarán siendo el mayor negocio de ALC en China, pero la dinámica de crecimiento de este país sugiere que para mantener el ritmo de crecimiento de las exportaciones, América Latina y el Caribe tendrá que apelar a un portafolio de bienes más diversificado. You can talk about China all you want, but heavy dependence on commodities is not the foundation of a healthy relationship. Unfortunately, that point does not get driven home very much after the beginning. One other thrust of the issue is that Latin America should learn from the Chinese economic model. Given that the model is based on authoritarian rule, this is problematic. The articles are striking apolitical. More precisely, they seem to pretend that politics does not exist. Nonetheless, check it out if you want to get an establishment view of how Latin America should engage with China. The training session started with a harsh public shaming. A performance coach took to the stage and asked eight employees at a Chinese bank to explain to a room of their peers why they had fallen short. “I didn’t cooperate well,” a woman said. “I wasn’t courageous enough,” another confessed. Then the session took a bizarre turn. The coach brandished a wooden stick and shouted, “Get your behinds ready!” He proceeded to slap the employees on their rears, going down the line four times. A woman recoiled in pain, and several workers gasped. When a man was caught hurling bags of money over the walls of a monastery in a sleepy town outside Buenos Aires last week, President Mauricio Macri benefited more than the nuns. The man turned out to be former Public Works Secretary Jose Lopez, second-in-command at the Planning Ministry for more than a decade and a close collaborator of the late President Nestor Kirchner. The bags contained more than $9 million in U.S. dollars, euros, Japanese yen and even Qatari riyal. Police also seized a Sig Sauer assault rifle and several watches. You can't make this stuff up. It has split Kirchner supporters, and of course can only benefit Macri, who is pushing a variety of controversial economic policies with decidedly mixed results. It appears that Cuban coffee will be the first product sold in the United States. Swiss-based Nespresso announced Monday that it will sell long-restricted coffee throughout the U.S. starting this fall, the latest evidence of renewed ties between the United States and Cuba after five decades of estrangement. The coffee will first be sold as a limited edition, called Cafecito de Cuba, in stores, online and over the phone, with the eventual goal of making it a regular product. And Le Cunff said the exotic, forbidden aspect of the coffee is a lure itself. "Our customers expect us to bring new coffee experiences, and they expect to be surprised," he said. "We know that with our U.S. customers, there is a high level of curiosity and excitement to have this coffee. So we expect a high level of response." So a combination of scarcity (initially intentional) and the exotic will increase demand. I have to wonder whether that demand will continue very long. The excitement of drinking previously forbidden coffee will fade quickly. If Cuban producers cannot produce in high volume, then the price in the United States will stay high, and most people simply won't drink it. That would work just fine for the other Latin American coffee producers who will now face new competition. Venezuelans are looting because they are not getting enough food. The government blames both the shortages and the looting on the opposition. As David Smilde notes in a quote, imports are way and there just isn't enough food. Meanwhile, the opposition is pushing to get signatures and the government is insisting no vote will happen this year, while labeling hundreds of thousands of signatures invalid. This doesn't seem sustainable--if people cannot get food, then they will want results from the government. The pressure on Maduro is intense. In the history of Latin America, this is the time when the military has traditionally stepped in, either as "moderator" or "director" (to take Alfred Stepan's categories). Rumors of military coups (usually focused on keeping Chavismo without Maduro) have been more or less constant in Venezuela. The military is involved in making arrests, which is never a good thing. The Defense Minister is saying the military can act against opposition leaders, which is a disastrous thing. To avoid that, some type of resolution has to be found. Since internationally-sponsored negotiations are currently going nowhere, I am not sure what that would be. James Loxton has a post at The Monkey Cage about "authoritarian successor parties" (parties that emerge from authoritarian regimes but continue after the transition. Using Keiko Fujimori's loss as a starting point, he notes how strong ASPs are globally. And generally, this doesn't matter much, which is a good thing. ASPs may even have some positive effects on democracy by helping to include former authoritarian incumbents in the new regime (thus discouraging them from becoming “spoilers”). This could inspire autocrats elsewhere to initiate their own transitions to democracy by showing that there is life after dictatorship. I think this point is the most salient. Negotiated transitions are facilitated by promises of future participation. This is also how you get rebel groups (like the FMLN and perhaps eventually the FARC) to lay down their arms and join the political system. If you block that participation, you're asking for trouble. At the same time, there are lot of apples and oranges. Chile's UDI was a strong, institutionalized party (which, incidentally, still has never won the presidency) whereas Alberto Fujimori was a personalist leader without a true functioning party behind him. There are also, of course, different kinds of transitions. Fujimori's flight from Peru bears little resemblance to the electoral loss of the PRI in Mexico. But an interesting topic, and I see he is working on a book, which should be worth checking out. 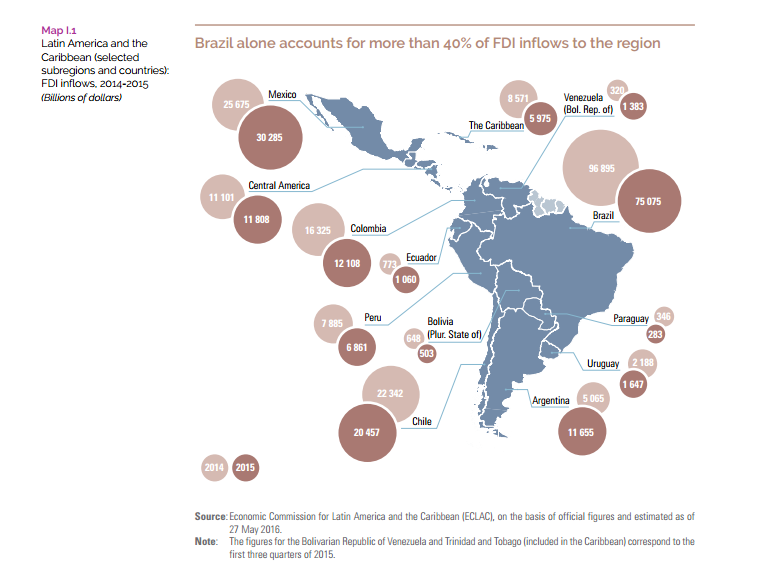 The UN Economic Commission for Latin America and the Caribbean reports that foreign direct investment into Latin America dropped 9.1% in 2015. If you read a little deeper, then you see that the aggregate number tells only part of the story. Brazil really drags that number down. For all the talk of violence in Mexico and Central America, FDI is up there (up 18% in Mexico) in large part because these are not based solely on primary products, prices for which are down. And for all the talk of loss of U.S. influence, the U.S. is by far the biggest source of FDI in the region. But overall this is bad news. 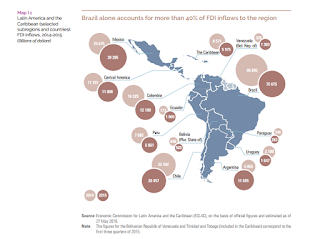 FDI is up globally but down in Latin America, with 2016 showing no signs of improvement, especially given the combination of recession and political crisis in Brazil. What we also know, of course, is that Latin America continues to do a poor job of weaning itself off of primary products in general. Beyond Brazil, dependence on commodities leads to these boom and bust problems. John Kerry announced talks will be held with the Venezuelan government. The U.S. side will be led by Tom Shannon, who is an old hand at this. This comes right after Kerry supported Luis Almagro's push for invoking the OAS' Democratic Charter and launching regional discussion about Venezuela's crisis. In recent months a key U.S. goal has been to avoid complete implosion in Venezuela. Violence and/or a power vacuum just allows more drugs to flow, more humanitarian disaster for Colombia, and more disintegration of PDVSA. Yes, this is the crux of the matter. Latin America needs to take charge here. Virginia Lopez at Al Ajazeera has a very nice piece on the oil disaster in Venezuela. We all know that oil prices are low, but PDVSA is producing less and less. The big recent news was that May 2016 saw a decline of 120,000 barrels a day. That means less money for the state, but it also means an environmental disaster because there are lots of leaks due to lack of maintenance. "What you have now is a company that favours loyalty above technical expertise," said a mid-level oil engineer who spoke on condition of anonymity for fear of reprisals. "A lot of the personnel that had the specialised knowledge felt disappointed and left to work in Canada, Colombia or Saudi Arabia." According to the engineer, PDVSA is so politicised these days that in the company "every Friday is a red Friday", in honour of the colour Chavez chose as the banner of his political movement. "We are made to wear red to show our allegiance to the government party. The few times I haven't I can feel colleagues glaring," he said. "The irony is that things have gotten so bad with them in control that even they are leaving." The result? Venezuela is talking to China about a grace period for their oil-for-loans deal. Venezuela needs a year of just interest while Venezuelan crude is under $50 a barrel because it is so cash-strapped. Without oil revenue, Venezuela is lost. As I was writing yesterday, it's unclear where this is all headed. There is serious political and economic crisis, but negotiations broke down. We can just hope that more are taking place privately. Given how high the stakes are and how likely it is he would lose, Nicolás Maduro says no recall referendum will happen this year. For a reminder, here is my post about the timing. What that means is that a Chavista will remain in power (it would be the VP if Maduro lost) and the economic can gets kicked down the road. Staying in office until 2018 was central to the government's offer to the opposition, which was rejected. The risk of that strategy is that people are starting to protest and loot. If at some point Maduro feels the need to get the military involved, he faces the potential of military backlash. The same goes for VP Aristobulo Isturiz if he were to take over. Negotiations failed. The OAS effort failed. The recall referendum will not prompt new elections. Oil prices remain low so there will be no infusion of cash. Inflation is triple digits and may soar over 700% this year. The currency is a disaster. During the Cold War, those opposed to U.S. policy toward Latin America worked closely with non-governmental organizations. In classes I use Kathryn Sikkink's Mixed Signals, which analyses in detail how NGOs were instrumental in compelling the U.S. government to accept the idea of human rights. International organizations like the Inter-American Comission of Human Rights were also important--though not always effective--avenues for addressing the abuses of Cold War military dictatorships. Now, all that is turned on its head. The Latin American left sees both NGOs and human rights organizations as tools of U.S. imperialism. The reason, of course, is that these types of organizations are highly critical of those in power. If you're president, they make you angry and so you lash out. Dictators like Augusto Pinochet did so, and democratically elected leaders like Rafael Correa do so. Their supporters then jump on the bandwagon as well. Civil society itself is called into question, as anyone critical of the government by definition becomes an agent of an outside power. During the Cold War, you were a tool of the Marxists; nowadays you're a tool of the Obama administration. Emiliana Duarte and Francisco Toro say at Caracas Chronicles that former Spanish PM José Luis Rodríguez Zapatero (who has been acting as a mediator between the Venezuelan government and opposition) offered a deal whereby the opposition would stop the recall effort in return for freeing political prisoners and allowing for more opposition judges in the Supreme Tribunal's Constitutional Chamber). Both Henrique Capriles and Leopoldo López rejected the offer. As deals go, it's remarkably undemocratic. We pack the courts, and so can you! Meanwhile, the CNE has accepted 1.3 million signatures for the recall. Assuming the recall referendum is not negotiated away, the question just remains timing. I voted in favor of this LASA resolution. Whereas: the international community of Latin Americanists has long stood in solidarity with struggles in defense of democracy. Be it resolved that: LASA denounces the current impeachment process in Brazil as antidemocratic and encourages its members to call the world's attention to the dangerous precedents that this process establishes for the entire region. It is much better written than some of the rambling, even incoherent ones in the past. It is succinct, which has not been the case with resolutions. But really, "casuistic"? Are we just trying to impress people with our vocabulary? Anyway, it's right. This process is not good for Brazilian democracy. Mexico is a functioning democracy whose voters tend to favor pro-business conservatives, not a North American version of Libya, exporting jihad and boat people to its neighbors. Somebody ought to explain this to Republican voters, whose brains, like pickles in brine, have marinated too long in anti-Mexican nonsense. That people need to be reminded of this is sad, but you can't blame people when they read that sort of thing, but then are also bombarded by negative images from the Republican candidate for president. There is plenty to debate in the article (such as seeing NAFTA as the savior of everything) but it's interesting to see pushback about Mexico from within conservative circles. Meanwhile, let’s state clearly what shouldn’t need saying but does: Americans are blessed to have Mexico as our neighbor and Hispanics as our citizens. On this point, disagreement is indecency. That's definitely not the sort of thing we've been hearing in recent years. Unfortunate that it required Trump to prompt it. Simon Romero interviewed Dilma Rousseff, who is at the presidential palace, just waiting. The main takeaway is her apparent belief that she might just come back to power. What always strikes me is that she talks of a coup, yet went very quietly. Even though she believes constitutional processes were abused, she still believes in the processes themselves. Meanwhile, the Senate announced that the proceedings will begin tomorrow and conclude in August, right in the middle of the Olympics. There will be protests and it will be a very global spectacle. As of now, Peru's Oficina Nacional de Procesos Electorales has counted 89.5% of the vote, giving 50.52% to Pedro Pablo Kuczynski and 49.48, with a difference of just 164,417 votes between them. Participation was 82.5%, which is obviously quite high. As Otto notes, this could switch but it's very unlikely. He made a big comeback. First, Keiko Fujimori's party has 73 of 130 seats in the unicameral Congress (John Carey and Steven Levitsky explain how the electoral system was responsible for the majority) so PPK cannot just come in and fulfill promises. Second, Peruvians don't like their presidents, who struggle to get approval ratings above the 20s (Peruvians don't like political parties much either). It's important to remember that national GDP numbers don't tell you much about how Peruvians feel. In fact, sources of GDP growth like mining are also sources of major civil conflict. So PPK faces a major uphill battle immediately. Third, I have to figure this will get lumped into the "decline of the pink tide" thing. But Peru has never fit that well--Ollanta Humala wasn't the leftist he was expected to be. Update at noon: with 92.5% counted, the lead is tighter. PPK at 50.32%, Fujimori at 49.68%. The difference is 103,383 votes. Update on 6/7/16 at 8:15 am: with 96.7% of the votes counted, it is even tighter. PPK is at 50.15% and Fujimori is at 49.85%. Now the vote difference is just 50,866. It ain't over 'til it's over. About half the remaining votes come from rural areas where Fujimori enjoys much support, while many of the rest are from foreign countries where Kuczynski is thought to have an advantage among expatriates. Analysts said Tuesday they thought Fujimori would collect a majority of remaining votes but possibly not enough to overtake her opponent. For Fujimori to achieve a tie, she would have to have 73% of the remaining votes. Given where the remaining votes [to be counted] are coming from, she should be able to make up some ground, but just a little,” said Ivan La Negra, a political science professor at Catholic University in Lima. Down to the wire, probably tomorrow. Update on 6/9/16 at 9:40 am. We're at 99.99% and PPK is 50.12% with Fujimori at 49.89%. The vote difference is 39,201, which is amazingly tiny. The ONPE says it will have a final result this weekend. You have to imagine there will disputes about votes, but for now the candidates have mostly been silent as everyone waits. I greatly enjoyed Héctor Abad's Oblivion: A Memoir. It is a story that takes place in Medellín from the 1960s until Abad's father is assassinated by paramilitaries in 1987. It is a love letter to his father, who he believed was perfect, and it is also a tragic portrait of dysfunctional Colombian politics and society, where there was no room for the center-left position his father was trying to carve out. It's touching how much he loves his father, and the story is always emotional, especially because you know how it's going to end. His father was a doctor who believed in going out to see the poor, which alone made him Marxist in the eyes of many. Later he protested paramilitary murders, which sealed that impression. Marxists criticized him for rejecting violence, so he was always stuck in the middle. The title refers to a poem by Borges, which centers on how eventually even memories of us disappear and we are truly nothing. This was Abad's way of pushing back against that a bit, to make sure his father was memorialized. I certainly won't forget him. Michelle Bachelet is suing the magazine Qué Pasa for defamation. The case revolves around the magazine publishing the transcript of a conversation that included allegations against Bachelet with regard to the Caval Case. The editors had quickly removed those parts of the transcript. According to Qué Pasa, Bachelet wants the journalists and editors to get three years in prison and pay about $7 million. This will have a chilling effect on Chilean journalism, which organizations like the Committee to Protect Journalists are pointing out. Presidents should not be going after journalists, and by doing so you put yourself into very bad company. Richard Nixon would be proud. The case has already fostered popular ridicule, such as this video. Barack Obama is walking a fine line in the Venezuela crisis. He can push the OAS, but forcing a vote and losing weakens U.S. policy considerably. He can speak out, but too much will simply give Nicolás Maduro rhetorical ammunition for little gain. Rhetorical wars never work. His policy, then, is primarily to use the model already being followed in Colombia and get neutral outsiders to foster dialogue. Whether or not that will work is open to question, but Obama has few options. On the left, he's criticized for doing too much and leading an imperialist plot to overthrow Maduro and take Venezuela's oil. This does not mention the fact that the U.S. already has ample access to Venezuelan oil. On the right, he's criticized for not doing anything, when he should be leading a "rescue," which is defined as having the OAS give Venezuela a list of things it must do. This does not mention the fact that the OAS is simply not built for doing any of those things. Remember how George W. Bush outlined a comprehensive policy of everything Cuba should do, claiming it was a regional effort? If you want isolation, contempt, and failure, then go for it. This is yet another example of how people overestimate what the U.S. realistically do. The U.S. can't just pull OAS strings. The U.S. cannot swoop in and save the day. And it shouldn't. Hari Seshasayee has a good rundown on the upcoming presidential second round in Peru on June 5. This second round of elections has been uniquely Peruvian. It is unlike most election scenarios we are familiar with: it is not between two political parties (like in the US), two political ideologies (left versus right), two dynasties (like in Bangladesh), nor is it one-sided. This election is between ‘Fujimorismo,’ the ideology espoused by jailed ex-president Alberto Fujimori, and anti-Fujimorismo, a formless mishmash of millions of Peruvians with varying degrees of opposition to Fujimorismo. The right wins no matter the outcome, but the question is whether it is the Fujimorismo right. Keiko is ahead in polls, but as he notes we have to be careful about making predictions. Support for the various national dialogue initiatives that may lead to, in accordance with the constitution and full respect for human rights, the timely and effective resolution of differences and the consolidation of representative democracy. You could easily take "timely" to refer to getting a recall referendum underway this year, as the timing of that is extremely important (Henrique Capriles takes "dialogue" to mean" referendum"). Further, the statement clearly says that representative democracy is not consolidated in Venezuela. But they're pretty vague, enough that the Maduro government can declare victory. I suggested yesterday that Argentina could take a central role in pushing Venezuela. This turned out to be wrong because I had not taken into consideration Susana Malcorra's bid for the UN Secretary General position, which has led her to take a much softer position than her own president. She does not want a strong stance on Venezuela to torpedo her chances. But that obviously got watered down, with the referendum itself being alluded to rather than mentioned. Update: See Boz's more positive take on how even a mild declaration moves the needle. Plan Condor was a Cold War effort (spearheaded by Manuel Contreras) that spanned multiple countries and had the approval of the United States. Its purpose was to coordinate the detention, torture, and death of so-called "subversives" who were fighting against South American military dictatorships. Fifteen retired Argentine military officers were just convicted of Plan Condor crimes. Read Patrice McSherry's excellent book on the topic (which I reviewed almost a decade ago). It's unfortunate that now "new Plan Condor" is being thrown around loosely. Luis Almagro calls for an OAS meeting and Nicolás Maduro says it is like Plan Condor. Rafael Correa said earlier this year that the Brazilian political crisis was like Plan Condor. This is unfortunate because unlike "coup" (which we can debate) Plan Condor bears no resemblance at all to what's happening in South America. Using it loosely makes it seem like any political machinations are exactly the same as hunting people down, torturing them, killing them, and dumping their bodies. That does a serious historical disservice. I have a piece up at Latin America Goes Global on Luis Almagro invoking the OAS Democratic Charter. My main point is that even if no specific actions are taken (and the OAS is simply not structured for action in the first place) it is important for regional leaders to have an open discussion about Venezuela and democracy more generally. The sad decline of Venezuela should be a vehicle for a broader discussion of democracy and the role of multilateral organizations in the protection of democratic institutions and rights. For one thing, the showdown has the potential to help define what Latin America wants in its democracies and of the OAS. If Luis Almagro can facilitate that sort of open debate, then we should consider this effort a success, regardless of the specific outcome. Go check the rest out over there. I'm also quoted in this story about the connection between this issue and changes in Cuba policy.